In a rather classless, poorly thought out and unfortunate response to some feedback left online, a high-class eatery has taken a public fall from grace due to a defensive barrage more suited to the stage of Jeremy Kyle than the civilised arena of fine dining. The saga began when a hen party, consisting of 18 young ladies, made a booking at 47 King Street West. Following their questionable experience in the establishment, which cost £600 in total, a member of the hen party left a 1* review on the restaurant’s Facebook page. In all fairness, she started off with the good points, namely that the restaurant was “nice” and the food was “fab“, but moved onto their disappointment with the “awful” service they received. The main complaint was that the party was split across two tables in spite of advising the restaurant of an increase in their numbers well in advance and that the diners whom arrived late were not provided with “fresh” starters. So far, so reasonable. Passionate indeed, the restaurant responded with a bombardment of school-yard style insults, none of them even particularly witty, literate or carrying much of a sting. The main response seemed to be pinned on the opinion that the group consisted of the “chaviest worst most vile people ever to grace our restaurant”. I know – shocking! Terrible, terrible grammar. As an outcome, not only did the grammar and language of the response highlight the restaurant in an unfortunate and unprofessional light, but it also appeared that it is an unpleasant place run by unpleasant people. 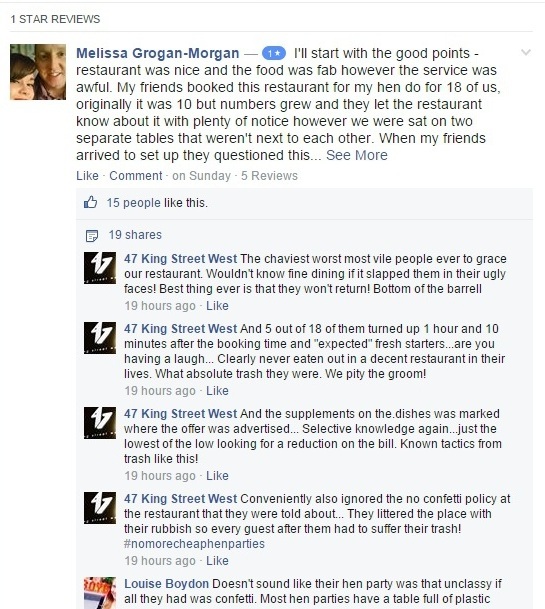 So, in spite of the “nice” atmosphere and “fab” food the hen party mentioned, 47 King Street West is losing fans left, right and centre. Let’s hope it is good at damage control! Seen any good or bad PR recently, you know what to do, @10Yetis on Twitter or andy@10yetis.co.uk on email.